Modern British heritage brand Belstaff continues its ongoing partnership with cult Japanese street-wear brand SOPHNET. The third limited edition capsule collection will launch globally on 24th January 18. Belstaff is steeped in its spirit of adventure having created clothing for pioneers in motorsports, aviation and exploration since the brand’s launch in 1924. SOPHNET. the popular Japanese street-wear brand takes inspiration from music, art and street culture. 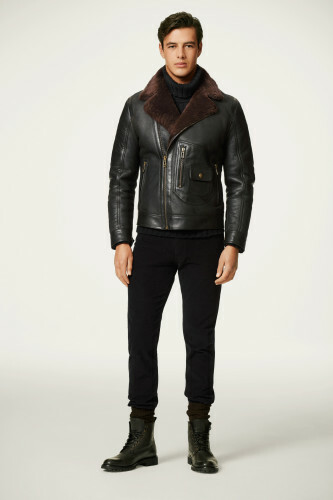 The third collaboration collection comprises of classic Belstaff silhouettes with identifiable SOPHNET. design cues, giving a more urban aesthetic for today’s streetwear market. Taking initial inspiration from Belstaff’s mainline ‘Paris to Dakar’ SS18 collection and the Belstaff 70s, 80s and 90s Archive, sports stripes and colour blocking can be seen throughout the collection. Belstaff’s iconic four-pocket Roadmaster BXS jacket is given a new look in camo print in Deep Electric Blue or Lava Red. The poly/nylon lightweight fabric is water repellent and windproof. The silhouette has been streamlined for a more modern fit. The camo print used throughout the collection is a British woodland camouflage, inspired by the extensive Belstaff Archive. The Roadmaster has the signature SOPHNET. cardholder pocket detail on the sleeve, antique brass hardware and belt. The Kersbrook BXS parka introduces a new silhouette to the capsule, with applied colour blocking, available in structured nylon or denim. This silhouette is taken from Belstaff Archive, from the 1970s Chris Bonnington Collection. The world renowned Mountaineer collaborated with Belstaff to launch this hooded parka style with circle logo. Available in Denim, Black or Navy Nylon, with camo lining and signature sleeve pocket. The HEMPTON BXS introduces a leather jacket to the capsule, inspired by the Cosset jacket from the Belstaff 1970s Archive. The sports inspired café racer is available in Black or Navy leather, with red or blue sleeve detail, sleeve and arm pocket with logo. The retro inspired jacket is kept modern with camo lining. A new denim jean is added to the line for the first time, the Paynter BXS indigo denim straight leg style incorporates a leather block detail, to work alongside the Kersbrook in the same material. The D ring attached to the belt loop adds a modern and practical edge. A new line of hoodies, Marfield BXS and t-shirts, Hynthon BXS, incorporate both brand logos and colour blocking, available in cotton fleece and heritage jersey, in Black, White or Navy. Completing the capsule collection is the Bilham BXS leather Sneaker. Available in classic white leather, with a contrasting black sole, and Velcro fastening. The capsule will launch in Isetan, Shinjuku, Tokyo and will be available in all global Belstaff stores, online, key partners and SOPHNET. stores. Belstaff is a modern British heritage brand steeped in the spirit of adventure, protecting independent spirits to venture free. In Belstaff, the fearless explorer and the stylish alike will discover clothing for a contemporary lifestyle influenced by Belstaff’s rich 94 year history, yet firmly rooted in the present and forever forward-looking.